Ill never forget being with Panick, my best friend who danced to this song like there was no tomorrow. The lights, the loudspeakers, the wild summer nights on the Mediterranean islands. Simply minds, Pet shop boys, and so many bands which gave us very important moments in our life back in the day. Today they are hard to even hear on the waves, or even find a good recording of it. I’m currently listening to it at a sample rate of 24/192 and I do have to say that, at the age of what I am today, I still have pretty good ears, although certainly not of the quality of what I had when I was young. The voice from You Cant Stop Falling, is much more deep than what I remember it to be, not deep as in highs or lows, but in depth of spatial area the vocals have compared to the music. Back in the day (as the saying goes) it was about the music, and the music alone. We didn’t know what quality was, that came when we got over 20. 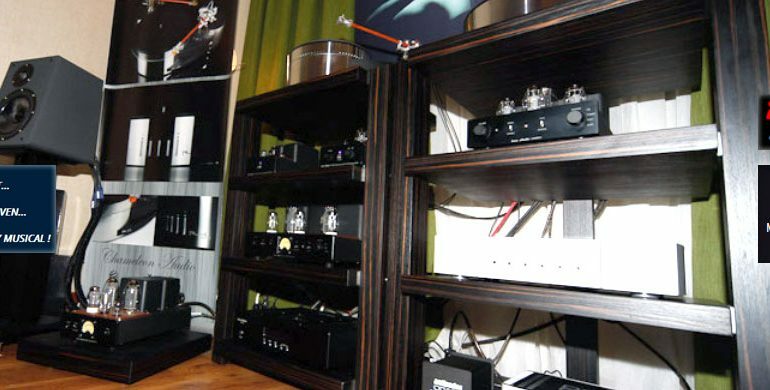 I say that because I had heard Klipsch horns when I was very young, but I was astonished only from those, no other speaker gave me the awe feeling than that specific speaker with a pair of bulbs. Honestly though, how many bars or clubs actually care about the sound, the actual quality of reproduction? I have a system which costs less than one speaker from that age, and it sounds 50 times better than it did back then (thank you technology and music lovers). After all, who played this pop music on high fidelity speakers? Now that I think about it, I wonder if anyone does other than my friends, which do quite often as they tell me. Suburbia, You can hide with the dogs tonight was a hit in the bars and the clubs as well. The album these songs are from is titled Please by the way. It was like a call for some type of sanity, and observation of what was going on in our society at the time. I wonder if most people would then actually listen to the songs and try to learn from them, or the songs from today do any change to the main core, or not so main core, of our personas. 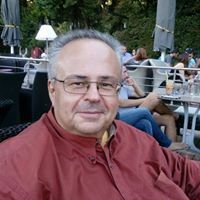 Did the quality of the music have to do with anything when it came or comes to pop music, rap, rock or any other music, excluding the older movements which seem to be part of our DNA. It seems it is (classical) the only music we all agree on worldwide. The question is though how many of us listened to classical when we were 18? How many people can get any meaning from the PET SHOP BOYS, other than entertainment of the moment? The answer is rather too complicated for anyone to imagine. I will just say that the Pet Shop Boys, Simple Minds, David Bowie, Pink Floyd, and every other rock and pop band that existed then, can still evoke momentous feelings, not measurable, but as desired, if not more so than classical. Sounds extreme? I’m sure it does, but its only a point of view. I let myself sink into the beat of Violence from the same album mentioned above and I close my eyes and listen to things I never heard when I was 18, I’m happy. I hear the keyboards, so much in fashion then, the 4/4 drum beat, the voice overs, the somewhat exchange of music and electrical instruments, yet I hear the drum, the boot, as it is not in life. I hear it, but feel nothing. I know it exists, but it is not hitting my sensations as classical or any other music reproduction of any type does of the time. Did they actually record music in the same manner in the 80’s or was it the digital revolution which was silently deleting notes from titles, making feelings and perceptions also go astray? I wonder if quality was a measurable component as it is today? Of course we had albums of the day, which honestly are the only way to hear the music. Digital recorded music is not that bad, but only unless we get this type of reproduction, at 24/192 can we truly get any real essence of the magic left behind from that era. The Reference 3A is more than apt yet again to play music from the era mentioned and had the recordings used been less inflicted from the painful electronic side of bass, then it would be a major plus. .The Icon Audio amp, despite the fact that it is class A (pentode is accessible from a switch), can easily play music of the era, but honestly can anyone listen to it in MP3?, unless it is a good recording on a machine, or an LP player. 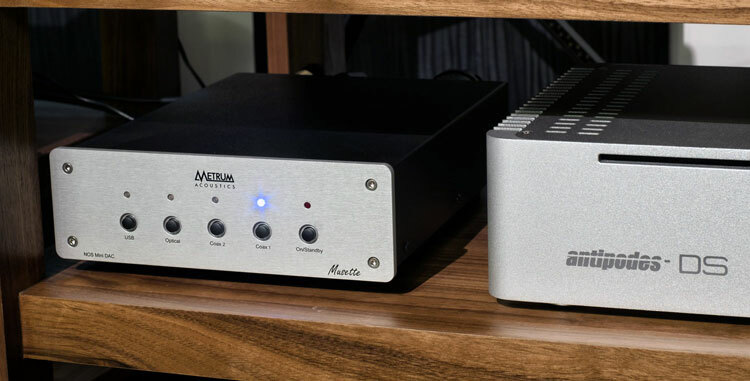 The Metrum DAC here is so sweet and hard when needed, which I have seen its virtues over and over again during this month or so of listening. Despite changes in cables, it kept to what was recorded, clean with nothing to hide, or overload in either position of the sphere of music. Sincerely, a good album, a great time reliving it and a sincere system to listen to it from…..
Audition System from Chameleon Audio : Reference 3A speakers, Metrum NOS Digital Source, Icon Audio amplification, TelluriumQ cables. 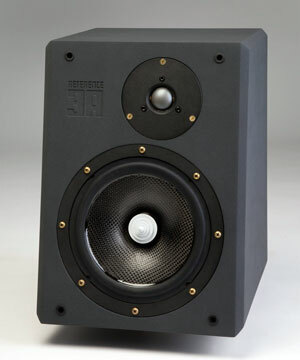 AQ (Acoustique Quality) Speakers from Czech Republic at Chameleon ! 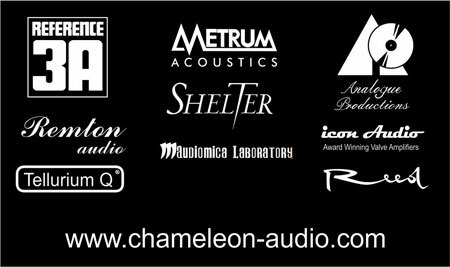 Chameleon Audio July Offers !